I have had issues with cucumbers recently. It’s strange because I used to dislike them but lately I can’t get enough. My body must be deficient in cucumber vitamins. 🙂 When I saw a box of organic cucumbers for sale at the farmer’s market I grabbed it. Don’t worry, I paid for it first. What’s a girl to do with a box of cucumbers but make pickles. All of the refrigerator pickle recipes I had called for white sugar. I haven’t had white sugar in the kitchen for some time. I wondered, could I use sucanat? I didn’t think that would work since it has a maple like flavor. I was also afraid it would make the pickle juice an unappetizing brown color. Then I wondered if I could use honey. I did some searching online and found two recipes. The first one seemed to be a simple and classic refrigerator pickle recipe with a few healthy adaptations. The second recipe was like nothing I had seen before. Pickles in lemon juice instead of vinegar. Cloves, really? I couldn’t help myself. I tried them both. This honey sweetened refrigerator pickle recipe is a great basic recipe with the traditional taste you expect from refridgerator pickles. There is a nice balance of salty, sweet and sour. Next time I make them I might throw in some garlic or dill for fun. Gently mix cucumbers, onion, salt and celery seed in a large bowl. Stir honey and vinegar in a small bowl until honey is dissolved. Pour over cucumber mixture. Mix well. Cover and refrigerate 24 hours. Pickles will keep 3 weeks or more in the refrigerator. And the second recipe? You can find it here. I never thought to use honey in my pickles! I used raw sugar and they turned out perfectly. I’ll have to try the honey next time. And I can’t wait to see the other recipe – sounds intriguing! Love the use of honey!! I’ve never heard of using honey, Nancy. Do these pickles taste different? Admittedly, we still use white sugar, but I am always looking for alternatives. This has caught my interest. I am enjoying your blog this morning. I am happily following you now. Some of these vegetables sound fantastic! I am no pickle connoisseur so I took them to a pregnant lady today. She said they were good and she did not taste the honey. Thanks for stopping by shilpa! I love honey. Have you tried drizzling it on fruit? I can’t wait to try these! I just picked a bunch of cucumbers and I was looking for something new to do with them, other than dill pickles! Thanks for linking up with Made From Scratch Tuesday! I can’t wait to try the honey ones. My daughter has been diagnosed with a dairy and sugar intolerence. Thanks so much for a super blog!! Thanks so much Tanya! I am so glad you are here! Next time when I buy cucumber I am going to try this recipe. Looks dleicious. Thanks for sharing with Hearth and soul blog hop. This looks like an interesting alternative. My garden is starting to mature and I will soon have a boatload of cucumbers. I will definitely be trying this recipe. Thanks for sharing! You out-did yourself once again. You’re amazing. Thanks for the recipe. I can’t wait for my cucumbers to come in so I can make tons of pickles! Wow – these pickles look great! Thanks for linking them up to Friday Potluck! 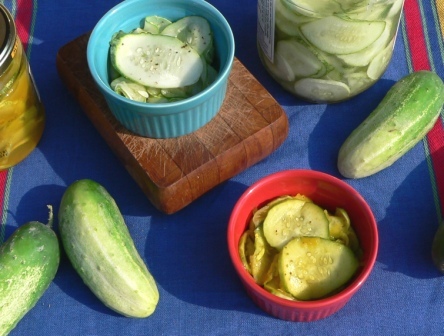 My husband loves sweet pickles and this looks simple and lovely! Thanks for sharing. Thank you for a beautiful wholesome recipe. First time visiting your blog and thrilled to see so many healthy things to carry me through the week ahead. Thank you so much Trish! You have some wonderful sounding dishes as well. I might have to try Camille Southard’s Brazillian Chicken! I love any kind of pickle. Sweet, dill, fried…I’ll eat them all. YUM! YUM! These babies are awesome. My new fav pickle. Thanks so much for posting!! Thanks so much for letting me know Melissa! Great idea! I used to be spoiled by homemade pickles when my grandfather was alive, but haven’t had any since. . . I may just have to give these a try. 🙂 Thanks for submitting to WW this week! I keep saying I want to make pickles. Maybe for National canning week. Great idea using honey, that sounds like the flavors would be great. Thank you so much for joining Fat Camp Friday! See you next week! Thanks Debbie! Let me know what the picky pickle person thinks! I love the idea of sweetening pickles with honey. I have avoided recipes that use sugar, so I am excited to apply this idea to some of the other recipes I’ve bookmarked. Thank you sharing this recipe with the Hearth and Soul Hop – I am feeling inspired! For the first 30 years of my life I wouldn’t touch a cucumber in it’s “un-pickled” form…. Now…like you, I’m lucky if there are any left to make pickles! Great post and thanks for sharing at the hearth and soul hop last week. Isn’t it funny how our tastes change? I’m glad I’m not the only crazy one! What a great recipe! I love using honey instead of sugar…excellent idea. Thank you for sharing this great recipe at Foodie Wednesday. Hope you can come by this week again and share another great recipe. I made pickles last week too! Aren’t they SO much better than store bought?! Thank you so much for linking this up to my Favorite Things Friday Party! I can’t wait to see what you will share this week!